Next is another photo from The Nashville Wedding Collection (this makes three) of our couple Roxy and Matt. After a rain storm came and went….fog rolled in and the photographer new that fog can create some amazing photos. This old truck was Matt’s project – his baby…….that he had transported up from Texas to be part of the wedding day. Part of this special photo comes from Roxy being barefooted….just a mix of interesting features on this one. No surprise that one of our finalists….our very best….is a goat picture. We try to temper our enthusiasms with all of our goats but occasionally one comes along that is just extra special – that spurs emotion when other people see it as well. As we often say – it is an odd phenomenon….the whole “bride with a goat” picture craze….and something that not just anybody can pull off. We have had a handful of extra special ones in our seven year history….and this one will be up there with the best of them. Kudos to Katie Britt Photography who got three photos selected in our Best of 2017. And a very fitting way to end our Best of 2017 Magazine Worthy gallery is with a way we often end our Farm Blog gallery presentation – with a sparkler send off shot. This one has some extra special lighting effects that makes it extra special and gives it that wow factor. Nothing like sparklers to light up a photo but this one is truly awesome. Congratulations to Bri Sanders Photography and the happy couple of Stephanie and Casey. I hope you enjoyed our line up and that you too were awed by the talent of our photographers. Please – leave a comment about some of your favorites in this line up. We look forward to another year upcoming. We always have a soft spot for a goat picture but this one stands out as a bit outside the box. Amy asked to go into the pasture for some photos which I warned her that our goats were very friendly so they would like by “up close and very personal” with her but she did not hesitate. Her photographer, Kelly Anne Photography, did not hesitate one bit. Next up is a rare pick in that it has no bride or groom in the photo. Most photographers will do a slew of these sorts of prop shots with the dress or shoes or rings, etc….but this one was just staged so cute that it looks ready for a advertisement of some sort. This next photo, again, looks perfectly staged for an advertisement for a bridal boutique. Color wise, this couldn’t have been more perfectly staged though it wasn’t. The colors in the doors blend so amazingly with the various colors of the bridesmaids dresses that it looks intentionally coordinated. Even beyond that – there are slight hints of a turquoise streaks in the barn doors that picks up the same color of the vintage couch. Now that the stage is set, you place some beautiful girls in it that all look happy as can be – and walla~this awesome shot by Kenny Photography. This one was taken in our tree tunnel. There is just something magical about the tree tunnel and the way the light comes through at various times of the year and even various times of the day can make a world of a difference in the photos. This one in particular just has some amazing lighting effects. The bride is Danielle and her photographer is Chavez Photos. Another awesome picture by Shane Hawkins Photography is of our sweet bride, Michelle. I remember that day escorting her around in the golf buggy and she knew she wanted to trek down to the creek….which isn’t always an easy proposition. I remember her having no hesitation in side-stepping out to the middle of the creek – barefoot and all. Next up is another Kenney Photography shot and this again comes from a bride, Lauren, goes against conventional wisdom and dares to do the unthinkable – go out in the rain in her wedding dress. It was not just to hopefully capture a great photo but purely for the romantic spontaneity of kissing your new groom, Derek, out on the patio and under the twinkle lights………in the rain! She dared the unthinkable and the Kenney’s made magic with it. We are up to eleven with a newcomer photographer, Katie Britt Photography, who captured this photo of Devin and Justin towards the end of the day. Though Lookout Mountain is in full autumn colors at this time, Katie opted to present this one in black and white….and it works. Devin seems to be a natural in front of the camera and her pose and positioning are spot on. This photo is of Amanda and Jonathan by Shine Photos. Again – a black and white photo has made the cut. Timing seems to often be the key in a great photo and here…..the lighting is sufficiently dark to let the mountain profile stand out but sufficiently light enough to see the couple in the foreground – and the expression on Amanda’s face and her husband is carrying her off into the sunset. Alexis found a great spot in front of one of our barn doors. The moisture content in the atmosphere that day sure did help with this photo by Brian Dean Photography. Next up is Kayla who chose the upstairs bedroom of the vintage farmhouse to do her prepping. Photographer Ashlandashaw Photography saw the lighting possibilities and found just the right angle for this photo. Bride Katie- her pose out in the hayfield with Lookout Mountain in a full autumn tapestry behind her gives a stunning backdrop to a perfectly blowing veil and stance – photo by Faulkner Photography. 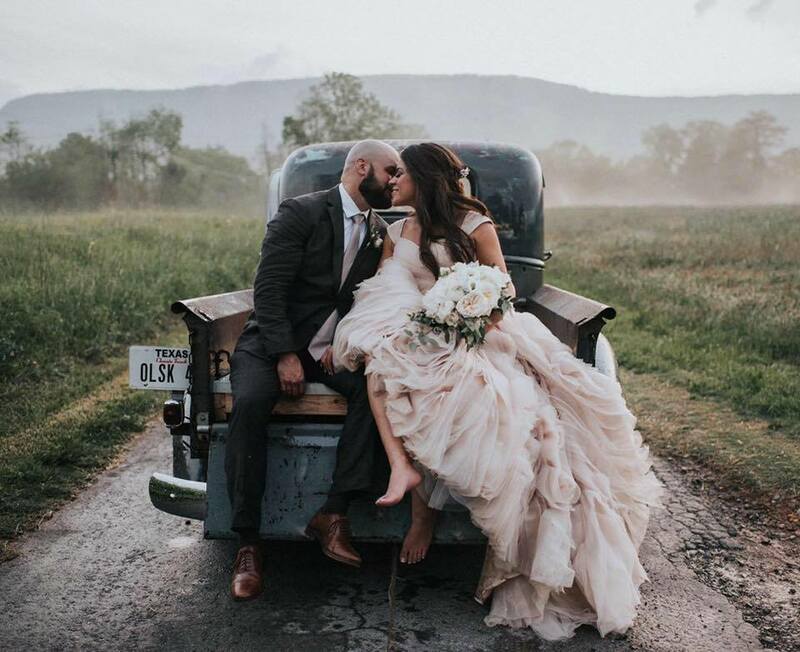 Bride Roxy was willing to be adventuresome when her photographer, Anthony, with The Nashville Wedding Collection darted her out into the fog-laden hayfield. Here she sat, bridal gown and all, into a patch of red clover with a bed of fog floating behind her. Sometimes the best photos come from taking advantage of the unusual circumstances and to be spontaneous with your photographer. Lauren and Derek out in the field – photo by Kenney Photography. Michelle and Bryan who got in the middle of the flower patch for their romantic shot – by Shane Hawkins Photography. This special photo is not even a bride – but her attire. Photo taken upstairs of the old farmhouse, photographer The Nashville Wedding Collection did a great job staging the dress and accessories. It is a stunning dress for sure…from the wedding of Roxy and Matt. Next photo is one of our sweet couples Samantha and Casey who went to the top of the hillside for this shot. Usually the angle is towards the valley, but this one caught our eye with the tender kiss, great position of her interesting bouquet, Samantha’s expression, and good lighting…..photo by Mike Moon Studios.